This entry was posted in TipOffs and tagged Business Income Tax, business income tax extension, business income tax extension online, business tax, business tax estimate, efile form 7004, Extension Tax, Form 7004, form 7004 extension tax, form 7004 tax extension, Tax extension on March 14, 2019 by Tax Expert. This entry was posted in Uncategorized and tagged 6-month automatic tax extension, extension of time, Extension Tax, Extension Tax reminders, Form 1040 income tax reporting, Form 4868, October 15 Deadline, Tax extension on October 10, 2018 by Tax Expert. The Internal Revenue Service today urged taxpayers who requested the six-month filing extension to double check their tax returns and file on or before the mid-October deadline. IRS e-file and Free File are excellent filing options and are still available. Members of the military and others serving in combat zone localities still have more time. They typically have until at least 180 days after they leave the combat zone to both file returns and pay any taxes due. This entry was posted in Commons, TipOffs and tagged 6-month automatic tax extension, extension of time, Extension Tax, Extension Tax reminders, Form 1040 income tax reporting, Form 4868, October 15 Deadline, Tax extension on October 4, 2018 by Tax Expert. IRS reminds taxpayers who are living and working outside the United States that the deadline to file their 2017 federal income tax return is Friday, June 15. The special deadline is available to both U.S. citizens and resident aliens abroad, including those with dual citizenship. An extension of time is available for those who cannot meet the June 15 deadline. The Internal Revenue Service today reminded taxpayers living and working out of the country that they must file their 2017 federal income tax return by Friday, June 15. The special June 15 deadline is available to both U.S. citizens and resident aliens abroad, including those with dual citizenship. An extension of time is available for those who cannot meet it. 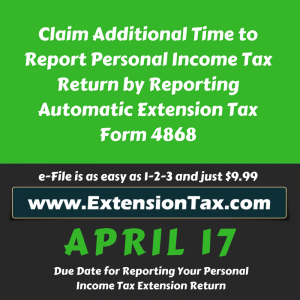 This entry was posted in Proffers, TipOffs and tagged Automatic Extension of Time, Automatic extension tax form 4868, E File extension tax request, extension of time, extension tax form 4868, extensiontax, Form 4868, Form 4868 eFile, June 15 deadline for 1040, Tax extension on June 11, 2018 by Tax Expert. IRS in the recent Tax Tip issue (Issue Number: Tax Tip Number 2018-55) covered the common errors to avoid when filing a tax return. Electronic filing can very well eliminate the common errors and will collect all required data to be filled in a tax return. However here is the tax tip from IRS…. To ensure they meet their tax obligations, taxpayers should file accurate tax returns. If a taxpayer makes an error on their tax return, it will likely take longer to process and could delay a refund. Taxpayers can avoid many common errors by filing electronically, the most accurate way to file a tax return. All taxpayers can use IRS Free File. This entry was posted in Commons, Product Diaz, TipOffs and tagged 6 month Automatic Extension, Automatic Extension of Time, Common Errors, Error free tax return, extension of time, Extension Tax, extension tax online, ExtensionTax.com, Form 4868, Form 7004, IRS owe refunds, IRS Tax Extension, IRS Tax Refund, Online Tax Extension, Prepare tax return online, Tax Claims, Tax extension, tax return on April 11, 2018 by Tax Expert. Further to that IRS has also highlighted in its Tax Tips (Issue Number: IRS Tax Tip 2018-53) for Getting Unclaimed 2014 Tax Refunds. This entry was posted in Commons, Product Diaz, TipOffs and tagged 6 month Automatic Extension, extension of time, Extension Tax, ExtensionTax.com, Form 4868, Form 7004, IRS owe refunds, IRS Tax Extension, IRS Tax Refund, My Refund Status, Tax Claims, Tax extension, Tax Refunds, Tax return claims, Where is my Refund? on April 6, 2018 by Tax Expert.